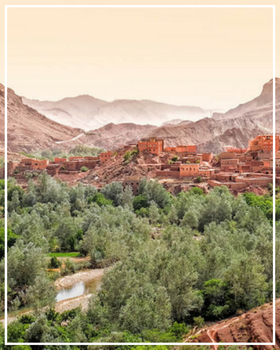 Sumptuous palaces, animated and colourful souks, a succession of breathtaking landscapes, charming and warm inhabitants...welcome to the Kingdom of Morocco! Located at the gateway to Africa, this fabulous country plunges into a universe of contrasts that is appreciated in all seasons, and in a thousand and one ways. And for a stay with 100% comfort and relaxation, let yourself be tempted by the rental of a beautiful villa or a riad pleasantly arranged. Nothing but the evocation of its name, Morocco is a real invitation to discovery and a change of scenery. From the snow-capped peaks of the High Atlas to the vast expanses of sand in the Sahara, passing by the cascades of the Akchour valley, it is a wild nature of unparalleled beauty that welcomes travellers from all walks of life. At the heart of this magnificent natural scenery are also the unavoidable vestiges and monuments that bring the cultural touch to Morocco. The Medina of Fez and the Ksar of Aït-ben-Haddou are part of these places to appreciate the authenticity of a history and a secular culture. Renting a villa or a riad in Morocco is one of the most beautiful ways to discover and appreciate the thousand and one faces of this country. On the shores of the lake, in the shade of a palm grove or in the heart of the famous Medina of Marrakech, we have selected for you superb properties, in an exceptional location, to complete your stay with family or friends in Moroccan lands. It is at the door of one of our sumptuous villas or our magnificent riads in Marrakech, Essaouira or Taroudant that you will leave for beautiful adventures. You will live, among other things, the unique and unusual experience of a night under the stars in the middle of the dunes of Merzouga, after a camel trek. Morocco also has a cuisine that seduces the taste buds of gourmands and gourmets. Children and adults will discover a tasty and generous cuisine, scented with herbs and spices. The mrouzia, a sweet-savoury variation of the traditional tajine, pastilla or msemen which is a Moroccan version of the crepe, are part of these delicious typical preparations that will make the senses travel when you go out to the restaurant. Sipping the traditional mint tea will be the highlight of a good meal. You will be able to try and prepare these succulent local specialties in the comfort of the kitchens perfectly equipped in the properties that we put at your disposal for your stay. Morocco is truly a flagship destination of North Africa, the country has everything to please: sumptuous natural sights, a culture of inestimable wealth and prodigious monuments. This kingdom, renowned for its great hospitality, offers numerous activities that are the delight of all the vacationers, whatever their profile. Treasures such as the fortified village of Aït-ben-Haddou of Ouarzazate, the beautiful Medina of Marrakech, or the archaeological site of Volubilis in Meknes, are examples of memorable places. Visiting this country will give you memories in your heart, but also in your luggage, because it is difficult to resist the products exhibited in coloured souks and other craft workshops. No matter which city you want to unpack your bags in, you will always find the Moroccan villa or riad rental that will suit you. Our advisors will be at your disposal to help you prepare your stay in the country of extreme sunset.